It’s a beautiful day for a The Cabin in the Woods Blu-ray exclusive clip. 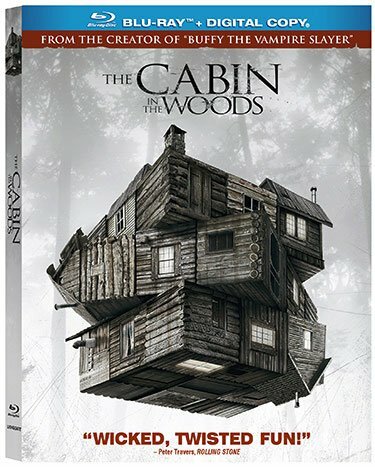 If you caught the film in theaters, or are waiting to experience the horror from the comfort of your own home, The Cabin in the Woods hits Blu-ray, DVD, and On Demand today, in a set that is chock full of bonus features, including some behind-the-scenes segments. To celebrate, Lionsgate has an exclusive Blu-ray bonus clip to share with fans that is a little on the funnier side for a horror flick. Be forewarned: The Cabin in the Woods is best experienced as a total surprise the first time through, and if you want to experience the film spoiler free, you’ll probably want to avoid the video, below, and just go straight to checking out the Blu-ray. The clip introduces fans to actors Richard Jenkins and Bradley Whitford, before showing us around in the famed control room. The two guys are pretty goofy as they wander around the control room, explaining certain elements and important spots. I think the best moment, however, is listening to them as they relate the ridiculous sequences of hitting buttons they had to memorize to make the whole control room look operational. The behind-the-scenes look is only one of many extras available with the Blu-ray set. Fans who purchase will also be privy to several featurettes, audio commentary, a Q&A, a look at the makeup and special effects, and much more. You can read more about the bonus features in our The Cabin in the Woods Blu-ray review, or just check out the full list of extras, below.